Detuners, D-tuners, what's inside de tuners. . .
Bill Keith is considered by many to be the father of modern chromatic style playing. 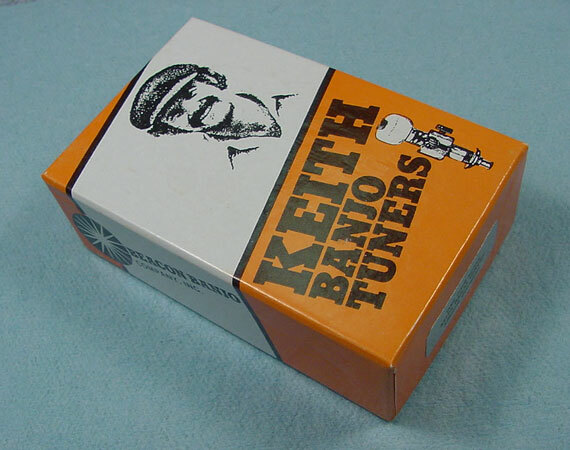 He's also the father of the most enduring banjo accessory, the tuner that bears his name. In the 1960s, Bill and his old Amherst College pal, Dan Bump sat at Bill's kitchen table with a pair of yellow legal note pads, madly sketching ideas for a means to eliminate the need for the two bulky additional "cam tuners" which Earl Scruggs had used to good effect switching from G to D tuning in the middle of such tunes as "Earl's Breakdown." Both Dan and Bill had spent long hours working on vintage automobiles with planetary gear transmissions and drum brakes. They used principles they'd observed in old cars to come up with the design for their new tuners. 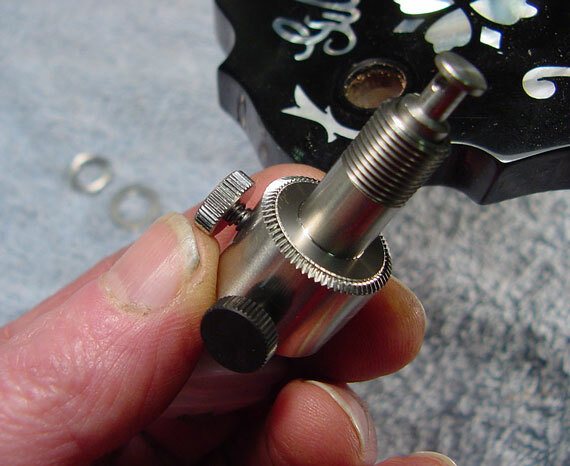 Bill had a machine shop at the time, so he set about actually making the tuners. Since their introduction more than three decades ago, these tuners have been the industry standard. Last week, Bill was kind enough to send me an unassembled tuner so I could photograph the parts and try to understand, then explain exactly how they work. Look these pictures over, and I think you'll agree that if a product is well enough designed and built, it simply doesn't need improvement! And, here's the tuner. As far as I know, it's still the finest piece of machinery available for a banjo. Machined of solid stainless steel, it's built solidly, and carries a lifetime warranty. 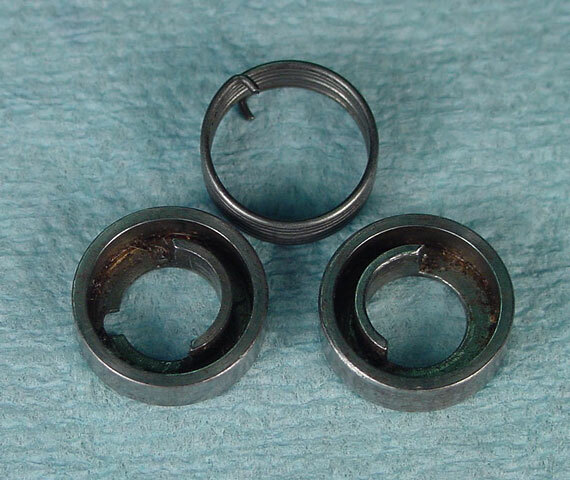 Personally, I've never seen one with a problem that couldn't be fixed with a few drops of oil. Inside the shell of this oversized banjo peg is a powerful array of parts! 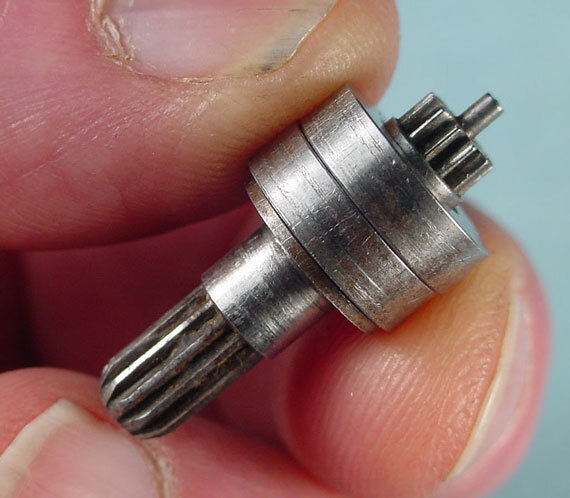 The planetary gear drive is the same mechanism used in other banjo pegs. I'll try to show you how this transmission works in the next few photos. This is the drive shaft. The end on the right is splined to hold the button. 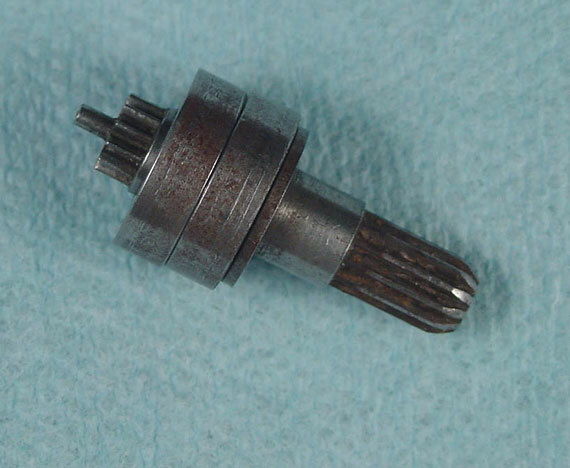 The end on the left is the small gear that drives the transmission. I'll talk about that fat section later. Here, the drive shaft is in place inside the housing, Notice that the button can be placed on the splined shaft in six different positions. Let's look at the drive train. You can see the small gear at the end of the drive shaft in the center. It's called a "sun" gear. Around the perimeter of is another gear, the "ring gear." Sitting between the sun gear and the ring gear, three planet gears "orbit" around the sun gear as the housing is held still and the drive shaft turns. 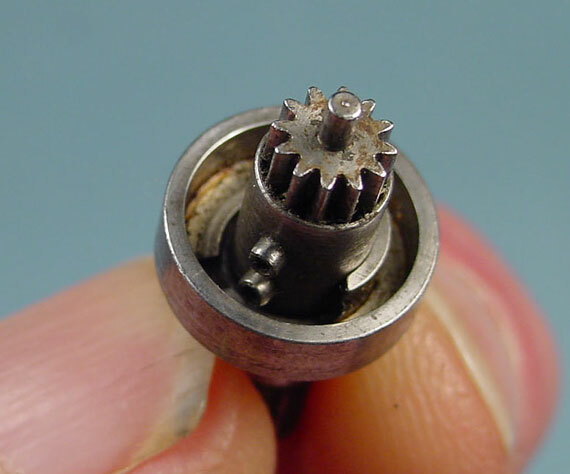 The "output" shaft has a little round plate on which the planet gears are mounted. 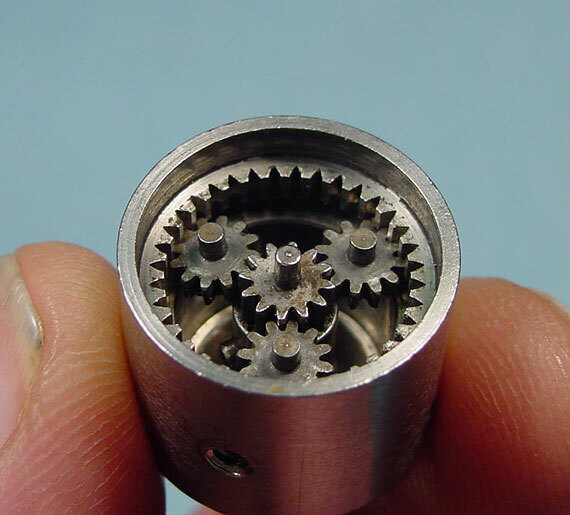 For this photo, I took the little planet gears out of the housing and stuck them in place on the output shaft plate. Going back to the assembled drive, you can see (or imagine) the output shaft rotating with the round plate as the drive shaft is turned. 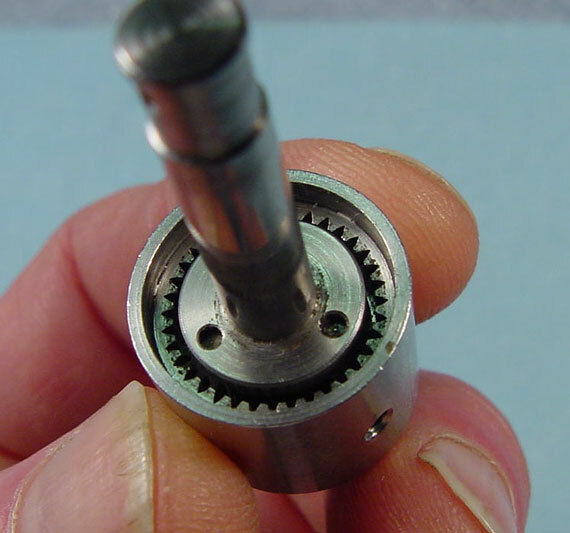 Because of the gearing, the output shaft turns once around for every four rotations of the drive shaft. So, the planet system has a gear ratio of four to one. Jeez, I hope all that was clear enough, because it gets a bit harder to explain from here. OK, back to the drive shaft and that fat section. The fat "tin can" section is actually composed of two major parts, the clutches which are the stopping mechanisms for the drive shaft. Look closely, and you can see two pins sticking out of the shaft. 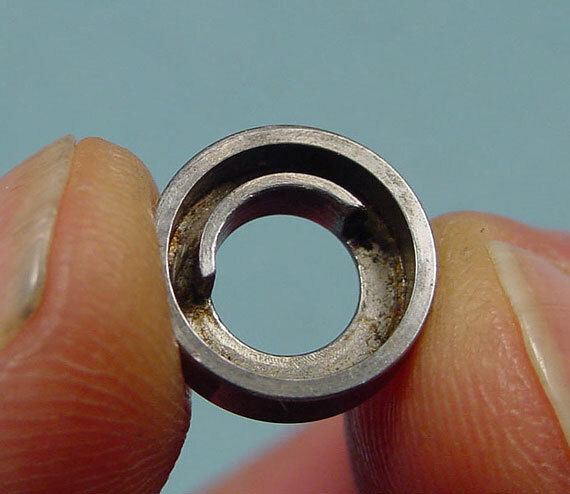 Each pin bumps into a raised semicircular portion of each clutch drum. This is one of the little clutches up close so you can see the area where the pins can rotate, stopping against the raised section. A little spring sits between the two clutches to keep them separated when the stops are set. On the side of the tuner, there are two side screws. 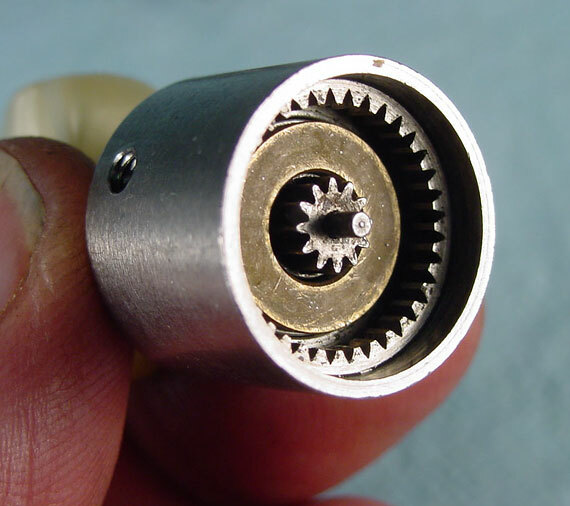 Each screw contacts the edge of one clutch, pining it solidly in place, stopping the rotation of the drive shaft at a precise location. 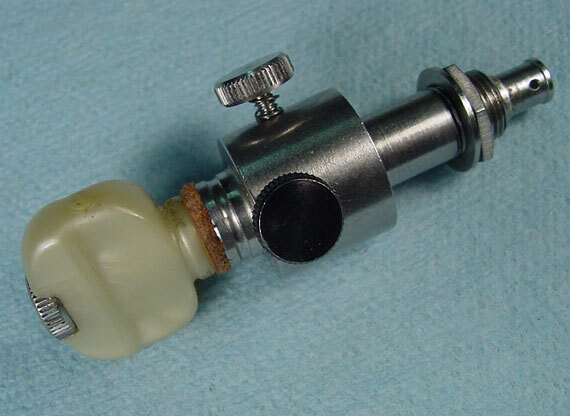 With both screws set, the tuner will oscillate between two positions. The side thumbscrews are color coded, black for the high note, uncolored for the low. 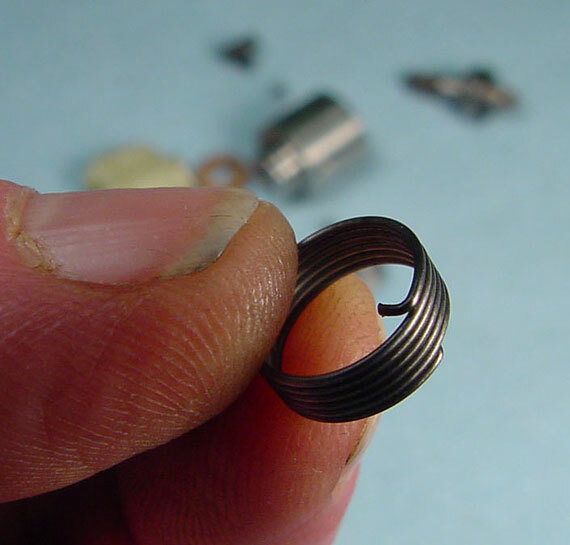 Each thumbscrew has a tiny spring underneath, so that when the screw is not engaged, there will be a bit of tension on the threads to keep if from vibrating loose and falling out. 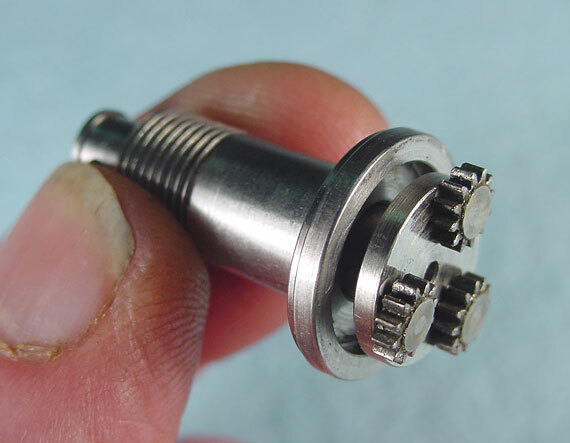 The entire assembly is held together in its housing when the top section is pressed in and secured by the coarse "knurling" which also serves to grip the banjo peghead when the peg is installed and screwed down from the top. 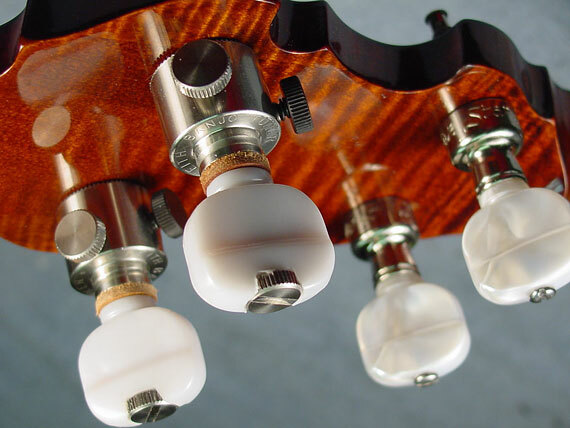 Because the third string is raised half a step, and the second string a full step, the post of the third string tuner is turned to half the diameter of the second string tuner. That way, each tuner button moves through the same rotation when they are used to switch from G to D tuning. 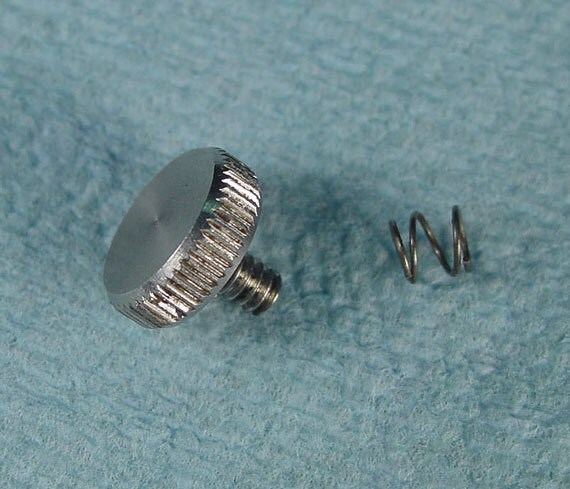 On installation, it's customary to rotate the side screws to a position convenient to the player. 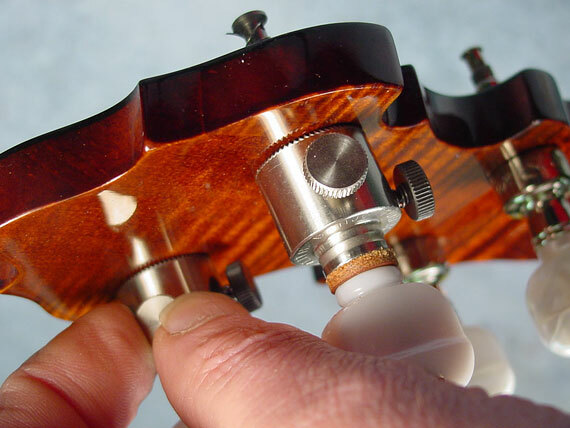 Because of the good gripping action of the tuner housing, it's no problem to reposition them. 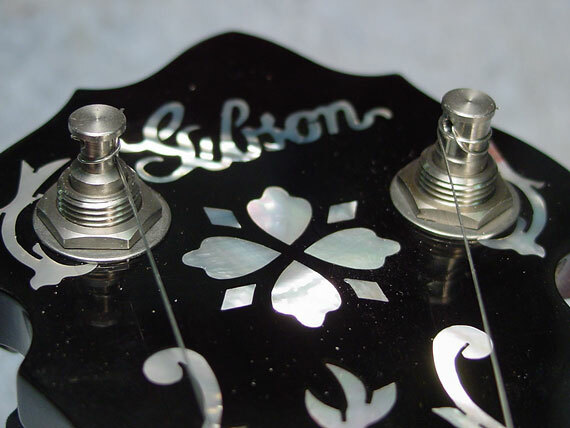 To set the tuners, you simply tune to "G" tuning, and lock the black thumbscrews. Then tune down to "D" and lock the two remaining thumbscrews. Now, the pegs will go up and down between "G" and "D" with ease and precision. Once the pegs are set, you can remove the buttons and replace them on the splined shafts so their position is most convenient for use.